Chronic sub-acute inflammation contributes to the pathogenesis of type 2 diabetes mellitus and cardiovascular disease. High doses of salicylate reduce inflammation, glucose and triacylglycerols, and may improve insulin sensitivity, suggesting therapeutic potential in impaired fasting glucose and/or impaired glucose tolerance. This trial aimed to evaluate the effect of salsalate vs placebo on insulin resistance and glycaemia in impaired fasting glucose and/or impaired glucose tolerance. We conducted a 12 week, two-centre, randomised, placebo-controlled study to evaluate the effect of salsalate (up to 4 g/day) vs placebo on systemic glucose disposal. Secondary objectives included treatment effects on glycaemia, inflammation and cardiovascular risk factors. Seventy-eight participants with impaired fasting glucose and/or impaired glucose tolerance from two VA healthcare systems were enrolled. Randomisation assignment was provided by the coordinating center directly to site pharmacists, and participants and research staff were blinded to treatment assignment. Seventy-one individuals were randomised to placebo (n = 36) or salsalate (n = 35). Glucose disposal did not change in either group (salsalate 1% [95% CI −39%, 56%]; placebo 6% [95% CI −20%, 61%], p = 0.3 for placebo vs salsalate). Fasting glucose was reduced by 6% during the study by salsalate (p = 0.006) but did not change with placebo. Declines in glucose were accompanied by declines in fasting C-peptide with salsalate. Insulin clearance was reduced with salsalate. In the salsalate group, triacylglycerol levels were lower by 25% (p = 0.01) and adiponectin increased by 53% (p = 0.02) at the end of the study. Blood pressure, endothelial function and other inflammation markers did not differ between groups. Adipose tissue nuclear factor κB (NF-κB) activity declined in the salsalate group compared with placebo (−16% vs 42%, p = 0.005), but was not correlated with metabolic improvements. The frequency of tinnitus was low but tended to be higher with salsalate therapy (n = 4 vs n = 2). In summary, salsalate therapy was well tolerated, lowered fasting glucose, increased adiponectin and reduced adipose tissue NF-κB activity. These changes were not related to changes in peripheral insulin sensitivity, suggesting additional mechanisms for metabolic improvement. The online version of this article (doi: 10.1007/s00125-012-2819-3) contains peer-reviewed but unedited supplementary material, which is available to authorised users. Weight gain and high-fat diets induce local and systemic inflammation [1, 2]. The inflammatory response may contribute to the development of insulin resistance and its associated metabolic abnormalities, such as glucose intolerance, dyslipidaemia and hypertension. While weight loss and physical activity remain central to diabetes prevention efforts, long-term adherence to lifestyle changes has proved difficult. Given the potential importance of obesity-associated inflammation to development of both type 2 diabetes mellitus and cardiovascular disease (CVD), efforts to develop and utilise anti-inflammatory agents to prevent these conditions are ongoing. Recent attention has focused on the salicylate class of anti-inflammatory medications. Salicylates are inexpensive, have been used for a century as anti-inflammatory and analgesic medications and have long been recognised to have glucose-lowering properties [3, 4, 5, 6, 7]. Additional enthusiasm for their possible role in treating metabolic disorders developed when it was discovered that these agents inhibit the activity of nuclear factor kappa B (NF-κB) [8, 9], a master regulator of inflammatory signalling pathways implicated in both the development of insulin resistance and atherosclerosis [1, 2]. Studies in rodents underscore the importance of activation of the NF-κB pathway in these conditions and have demonstrated that salicylates effectively inhibit inflammation and improve insulin sensitivity and lipid metabolism [10, 11, 12, 13]. Recent studies in persons with type 2 diabetes convincingly demonstrate that high doses of salicylates lower blood glucose, which raises the possibility that they may improve insulin sensitivity [14, 15, 16, 17]. Several small studies in obese non-diabetic persons demonstrate that relatively short-term use of salicylates lower fasting glucose and/or improve systemic inflammation and lipid profiles [18, 19]. Improvements in these multiple metabolic abnormalities would have great clinical significance if they persist with extended use. However, studies examining how salicylates influence insulin resistance and insulin secretion have been discordant [15, 16, 19, 20, 21, 22, 23, 24]. Possible reasons for variation in the effects of salicylate on these outcomes include: (1) some studies used only indirect measures of insulin resistance; (2) salicylic acid appears to delay insulin clearance, thereby elevating insulin levels and confounding estimates of insulin action and secretion and (3) glucose and lipid lowering per se indirectly improves insulin sensitivity in dysmetabolic individuals. Individuals with impaired fasting glucose and/or impaired glucose tolerance are typically overweight, insulin resistant and dyslipidaemic, with evidence of systemic inflammation and endothelial dysfunction, and often are hypertensive. Identifying an inexpensive and relatively safe medication that favourably alters the metabolic abnormalities and slows development of type 2 diabetes and CVD would be of great benefit. We therefore conducted a randomised, placebo-controlled trial in a population with impaired fasting glucose and/or impaired glucose tolerance using 3 months of treatment with salsalate (a non-acetylated, prodrug form of salicylic acid) and performed serial measurements of glucose tolerance, insulin resistance, CVD risk factors and adipose tissue and systemic inflammation. This was a 12 week, two-centre, randomised, placebo-controlled, parallel-group study to evaluate the effects of a maximal tolerable dose (up to 4 g/day) of salsalate compared with placebo on glycaemia, insulin resistance, CVD risk factors and inflammation in individuals with impaired fasting glucose and/or impaired glucose tolerance. Participants and all research staff were blinded to treatment assignment during the study. Participants were veterans aged 21–75 years with impaired fasting glucose (i.e. ≥ 5.6 but < 7 mmol/l) or impaired glucose tolerance (2 h glucose values ≥ 7.8 but < 11.1 mmol/l) during a standard 2 h 75 g OGTT. Study participants were recruited from clinics and hospitals throughout the Phoenix and Boston VA Health Care systems. Informed consent was obtained and study activities were approved by institutional review boards at each site and carried out in accordance with the principles of the Declaration of Helsinki. After enrolment there were 1 week screening, 3 week single-masked placebo run-in (to assess compliance) and 12 week randomised, double-masked treatment periods, with participants randomised 1:1 to receive salsalate or placebo. Participants with less than 80% compliance by pill count after the placebo run-in or who were unable to reliably attend scheduled visits were not eligible to continue. Salsalate or identically appearing placebo (Caraco Pharmaceutical Labs, Detroit, MI, USA) was initiated at 3.0 g/day and increased at weeks 2 and 4 of the treatment period to 3.5 and 4.0 g/day, respectively, in divided doses twice daily, as tolerated. Trough salicylic acid levels were obtained before morning dosing at weeks 4, 8 and 12. When non-serious side effects occurred or salicylic acid levels exceeded 2,172 μmol/l (30 mg/dl), the protocol dictated dose reduction to the maximum tolerable dose, which was continued for the duration of the study. Weight and blood pressure were monitored throughout the trial. Major assessments performed at baseline, week 8 and/or week 12 included OGTT and measures of fasting blood lipids, inflammatory markers, endothelial function and insulin sensitivity. End-of-study efficacy measurements were conducted in the order performed at baseline and while still on assigned drug within a 7 day window of completing the 12 week randomised drug phase. Subcutaneous abdominal adipose tissue biopsies were performed on an unselected subset of participants (n = 38) from both study sites at baseline and week 12 before initiation of the hyperinsulinaemic–euglycaemic clamp. Collected tissues were rapidly cleaned and immediately frozen in liquid nitrogen for subsequent whole-tissue assays (see electronic supplementary material [ESM] Methods). Plasma lipids, salicylate, glucose, insulin, C-peptide, NEFA, inflammatory markers and adipose tissue DNA binding activity of NF-κB were measured by the hospital clinical laboratory or in P. D. Reaven’s laboratory at the Phoenix VA Medical Center (ESM Methods). All assays have CVs of less than 12% for within- and between-run precision. Participants were admitted to the Clinical Research Units at 06:00–08:00 hours after an overnight fast. Euglycaemic–hyperinsulinaemic clamps were conducted at baseline and at the end of the study as previously described . Because salsalate therapy appears to decrease insulin clearance leading to higher circulating insulin levels during the clamp [15, 16, 19, 20], we reduced the infusion rate of insulin in the active treatment arm by 20% (from 100 to 80 mU m−2 min−1) at the study end. Insulin solutions were prepared by the site pharmacist so that study staff remained blinded to drug assignment. Whole-body insulin sensitivity was estimated from glucose infusion rate (GIR) during last 30 min of insulin infusions. Metabolic clearance of insulin in the fasting state was estimated by fasting C-peptide (pmol/l) divided by fasting insulin concentration (pmol/l) and during the euglycaemic–hyperinsulinemic clamp by insulin infusion rate (mU/min) divided by average insulin concentrations (mU/ml) during the last 30 min of insulin infusion . Endothelial-mediated arterial responses at the distal phalanx of a finger during hyperaemia were measured as previously described [27, 28] using peripheral arterial tonometry (PAT; Itamar Medical, Caesarea, Israel) normalised to concurrent readings from the control arm (ESM Methods). Statistical analyses were performed with SAS v9.2 (SAS Institute, Cary, NC, USA). Data are reported as means ± SD or medians (interquartile range or 95% CI). Paired comparisons (follow-up vs baseline) and unpaired group comparisons were performed by Student’s t tests or Wilcoxon signed rank tests. The effect of salsalate over the study period was tested by repeated measures analysis of covariance (ANCOVA) using general linear mixed model procedures adjusted for study site. The Tukey multiple comparison test was used to identify the effect of treatment on study variables at weeks 8 (OGTT) and 12 (OGTT and clamp). Data were log transformed for ANCOVA models if not normally distributed. Spearman correlations were used to analyse relationships between relevant metabolic variables and change (follow-up minus baseline) in salicylic acid levels or NF-κB activity. Seventy-eight individuals entered the placebo run-in phase. Of these, 71 were randomised and 70 returned to receive study medication (Fig. 1). The frequency of tinnitus was relatively low (n = 4 for salsalate, n = 2 for placebo), only one instance was graded > mild. Gastrointestinal complaints did not differ between groups (n = 8 for salsalate, n = 5 for placebo). No hypoglycaemia occurred. The mean dose of salsalate was 3.7 g/day (one participant tolerated 2 g/day, seven tolerated 3 g/day, three tolerated 3.5 g/day; all others received 4 g/day). Salicylic acid levels were 854 ± 586 μmol/l at week 8 and 695 ± 456 μmol/l at week 12. Similar numbers of participants withdrew from each treatment arm (salsalate n = 4, placebo n = 5) before the first efficacy assessment at week 8, and 29 participants per group completed both baseline and end-of-study euglycaemic–hyperinsulinaemic clamps. Baseline characteristics of study participants are shown in Table 1. As expected for individuals with impaired fasting glucose and/or impaired glucose tolerance, mild elevations in fasting glucose, 2 h glucose, triacylglycerols and C-reactive protein (CRP) were present. Fifty-one and 64% of participants were taking lipid-lowering and antihypertensive medications, respectively. No baseline differences in clinical characteristics were present between treatment groups. Fasting glucose was reduced within the salsalate group by 7% and 5% at 8 and 12 weeks, respectively, and was 6% lower overall compared with placebo (p < 0.05) (Fig. 2a). 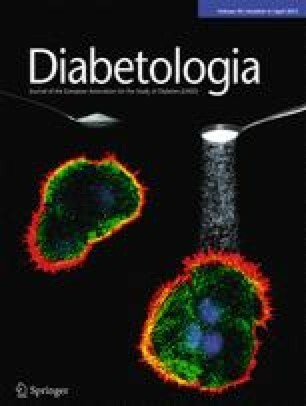 Decreases in fasting C-peptide paralled declines in fasting glucose in salsalate-treated participants compared with placebo (p < 0.0001, Fig. 2b). In contrast, there was no change in fasting insulin concentrations in either treatment group (Fig. 2c). Fasting NEFA levels trended downward in both groups (Fig. 2d); this difference compared with baseline was significant (p < 0.05) within the salsalate group at week 12. However, overall changes in NEFA levels were similar between treatment groups. In contrast to changes in fasting glucose concentrations, no treatment-related differences were seen in total or incremental AUC changes in glucose during the OGTT (Fig. 3a, b). Similarly, no differences between treatment groups were seen in insulin responses during the OGTT (Fig. 3c, d). However, both C-peptide and NEFA levels in response to the OGTT decreased more in the salsalate than in the placebo group (Fig. 3e–h). These data suggest decreased insulin secretion during the OGTT with salsalate, while maintaining similar glycaemia. Fasting triacylglycerol concentrations declined (27%, p < 0.0001) by week 8 within the salsalate group and remained 25% lower at 12 weeks (p = 0.003). These changes were greater than those seen in the placebo group (p = 0.004, Table 2). HDL-cholesterol was higher (7%, p = 0.004) compared with baseline values at week 12 within the salsalate group, but did not differ between placebo and salsalate groups (p = 0.2). Consequently, the triacylglycerol/HDL-cholesterol ratio was lower overall in the salsalate group compared with placebo (p = 0.003). LDL-cholesterol levels increased modestly but significantly with salsalate therapy (p = 0.003 vs baseline; p = 0.01 vs placebo), while the total cholesterol/HDL-cholesterol ratio decreased slightly and similarly in both groups. Adiponectin increased by 71% at 8 weeks and remained 53% higher after 12 weeks of salsalate (p = 0.02 vs baseline; p = 0.05 vs placebo) (Table 2). Changes in weight, blood pressure, creatinine, CRP, IL-6 and soluble vascular adhesion molecule 1 (sVCAM-1) (Table 2) and endothelial function estimated by the PAT index (ESM Fig. 1) did not vary by treatment group. Whole-body insulin sensitivity as estimated by total glucose utilisation did not change in either salsalate (1% [95% CI −39%, 56%] p = 0.8) or placebo (6% [95% CI −20%, 61%] p = 0.5,) groups (Fig. 4a) and did not differ between treatment groups (p = 0.3). Insulin levels during the steady-state period were similar at baseline and follow-up in both placebo and salsalate treatment groups (Fig. 4b). Essentially identical glucose utilisation results were present when each individual’s glucose utilisation was adjusted for average insulin levels during 150–180 min of the euglycaemic–hyperinsulinaemic clamp (not shown). Additional analyses were performed: restricting evaluation to those individuals receiving ≥ 3.5 g/day of salsalate; using models based on plasma salicylate concentrations, normalising glucose utilisation for estimated fat-free mass or without correction for weight or body composition or assessing for heterogeneity of response based on age above or below the median. None of these analyses indicated a salsalate treatment effect on insulin sensitivity. The metabolic clearance of insulin was calculated in the fasting condition and during the clamp. Compared with placebo treatment, insulin clearance was significantly decreased (p < 0.0001) in the fasting state (Fig. 4c) and there was a trend for delayed clearance during the clamp (p = 0.06) in the salsalate group (Fig. 4d). C-peptide levels during the clamp (150–180 min) were similar between groups at the end of the study (517 vs 487 pmol/l, p = 0.9), excluding the possibility that salsalate therapy increases endogenous insulin secretion and would thereby confound calculations of insulin clearance. Although the range of salsalate dosing was relatively narrow, blood salicylic acid concentrations varied substantially within and between individuals throughout the study (< 360 to 2,900 μmol/l). Mean salicylate concentrations during weeks 8 and 12 (when efficacy outcomes were conducted) inversely correlated with the change in fasting glucose concentration (r = −0.54, p = 0.002, Fig. 5), suggesting that reductions in fasting glucose were related to salicylic acid levels. Mean salicylate concentrations also correlated with the change in fasting adiponectin concentration (r = 0.43, p = 0.02). In contrast, there was no correlation between salicylate levels and GIR, either with or without adjustment for insulin concentrations achieved during the final 30 min of the eugylycaemic–hyperinsulinaemic clamp. Adipose tissue NF-κB activity was measured in 38 consenting participants. NF-κB activity did not differ between groups at baseline, but decreased in salsalate- vs placebo-treated groups at 12 weeks (p = 0.005, Fig. 6a) and there was an inverse correlation between change in adipose tissue NF-κB activity and plasma salicylate levels (p = 0.02, Fig. 6b). Despite changes in adipose tissue NF-κB activity with salsalate therapy, inflammatory gene expression (TNFα, IL-6, IL-8, Il-1β) was unchanged in adipose tissue from salsalate-treated participants (data not shown). The study goal was to determine whether targeting inflammation with salsalate improves dysglycaemia, insulin resistance and related metabolic abnormalities in patients at risk for diabetes. Fasting glucose was reduced by 6% in salsalate- vs placebo-treated individuals. This change was particularly impressive as glucose levels were only slightly above normal at baseline and the reduction occurred without hypoglycaemia. Our finding is consistent with previous reports of glucose-lowering effects of aspirin and salsalate in both diabetic [4, 5, 6, 14, 16, 17] and prediabetic [18, 19, 23] individuals. The adipokine adiponectin, which has been associated with improvement in insulin sensitivity and lower atherosclerotic risk, was increased 53% at the end of the study. Triacylglycerols and the triacylglycerol/HDL-cholesterol ratio both decreased > 23%. LDL-cholesterol increased without change in the total/LDL-cholesterol ratio. The improvements in glucose, adiponectin and triacylglycerol levels are generally consistent with changes observed in smaller studies in obesity  and type 2 diabetes . The metabolic improvements are anticipated to benefit individuals with impaired fasting glucose and/or impaired glucose tolerance, and support further long-term study of salsalate in this population, although LDL-cholesterol effects warrant further investigation. We demonstrate for the first time decreased adipose tissue NF-κB activity in humans following salsalate administration. The magnitude of reduction in NF-κB activity correlated with plasma salicylate levels, supporting a direct effect of salsalate. Reduced NF-κB activity could be due to changes in adipocytes, endothelial cells, leucocytes or a combination of cell types. However, despite reduced adipose tissue NF-κB activity, we were unable to detect changes in ex vivo production of cytokines by adipose tissue or in vivo circulating concentrations of cytokines. NF-κB is a transcriptional regulator of multiple inflammatory gene products and modest downregulation of NF-κB activity could change many inflammatory markers and mediators modestly but meaningfully ; however, such changes in individual inflammatory proteins may not be detected in this moderate-sized study cohort. It is also possible that the modest declines in adipose tissue NF-κB activity and related inflammatory changes were not sufficient to modify insulin action and that other molecular targets of salicylates may participate in the metabolic improvements [29, 30, 31, 32, 33, 34]. In this study, metabolic benefits were not accompanied by improved whole body (peripheral) glucose utilisation measured during euglycaemic–hyperglycaemic clamps. Salicylates have previously been demonstrated to reduce insulin clearance [15, 16, 19, 20], potentially raising insulin concentrations during hyperinsulinaemic clamps beyond concentrations where the relationship between glucose utilisation and insulin is linear. In this setting, adjusting glucose utilisation for ambient insulin levels may incorrectly normalise estimates of insulin action between treatments. By titrating the rate of insulin infusion during the post-treatment clamp in the salsalate-treated group, we were able to maintain similar insulin concentrations in the paired baseline and follow-up clamp studies in both treatment groups. This permitted a clearer comparison of GIRs and avoided the need for adjustment for disparate steady-state insulin levels, as has previously been required [15, 19, 20]. In the current study, the metabolic benefits of salsalate thus appeared unrelated to changes in peripheral insulin sensitivity. Importantly, sensitivity analyses revealed that similar results were obtained even when dose of salsalate ingested or plasma salicylate concentrations were modelled. Our findings are consistent with those of Koska et al , who also found there to be no improvement in insulin sensitivity in obese individuals, but differ from those of Hundal et al , who demonstrated improved insulin sensitivity in nine patients with type 2 diabetes following very-high-dose aspirin, even when insulin levels were matched. Reasons for these different findings remain incompletely understood but could be related to dose, or to differences in response between persons at risk for diabetes compared with those with established diabetes and hyperglycaemia. It is important to understand how salsalate improves fasting glycaemia, triacylglycerols and NEFA levels. Although this study does not provide definitive answers one may speculate that salsalate favourably impacts the liver. Obesity and high-fat diet activate NF-κB pathways in hepatocytes  as well as adipocytes and associated macrophages . A recent report indicated that salicylates reduced hepatic NF-κB activity and hepatic VLDL triacylglycerol production in mice . Our finding of reduced fasting glucose (with similar fasting insulin concentrations) in the absence of reduced postprandial glucose or peripheral insulin resistance also suggest an effect on basal hepatic glucose production, similar to that seen with the acetylated salicylate, aspirin . It is also possible that delayed postprandial insulin clearance and the resulting transient periods of hyperinsulinaemia suppress hepatic glucose production and modify lipoprotein metabolism. Elevations in adiponectin may also modulate fatty acid oxidation, lipid synthesis, lipoprotein metabolism and gluconeogenesis, all events previously ascribed to adiponectin . As our study did not address mechanisms for adiponectin changes, we cannot determine whether salicylates may directly enhance gene expression or protein production or perhaps alter adiponectin clearance. Similar to previous reports [15, 16, 19] we found evidence of delayed insulin clearance with increased fasting insulin:C-peptide ratios. As direct evidence for delayed clearance, with insulin infusion reduced by 20% during the post-salsalate clamp, insulin concentrations rose to levels nearly similar to those seen during the pretreatment clamp. Although it is conceivable that C-peptide clearance could be increased, which would complicate interpreting insulin:C-peptide ratios, this seems unlikely as C-peptide is largely cleared by the kidney and we had no evidence of altered renal function based on estimated glomerular filtration calculations. These results bolster earlier reports that salsalate delays insulin clearance [15, 16, 19, 20]. It is possible that by reducing insulin clearance, periods of higher insulin result in lowered glucose, reduced C-peptide, decreased lipolysis and lower NEFA concentrations—all changes seen in the salsalate group. However, elevations in insulin would presumably need to be relatively transient and/or subtle as insulin concentrations did not significantly differ between treatment groups in the fasting state or during the OGTT. Insulin secretory demand was also reduced, as demonstrated by lower C-peptide levels both fasting and postprandially, presumably due to delayed insulin clearance and reduced glycaemia. This suggests that chronic salsalate therapy may have beta cell-sparing effects, which could be beneficial in impaired fasting glucose and impaired glucose tolerance where preserving beta cell function is important. Although several studies have suggested that salicylates may enhance insulin secretion [21, 23, 24, 37, 38], these either tested in vitro or acute effects or relied on insulin and not C-peptide levels, and therefore may not identify the consequences of delayed insulin clearance on estimates of insulin secretion with chronic therapy. Determining how salsalate reduces insulin clearance in humans remains an interesting and potentially important clinical question. Understanding these events may also help to identify new targets for drug therapy directed towards preserving beta cell function. Cardiovascular safety in impaired fasting glucose and impaired glucose tolerance is important. Despite improvements in fasting glycaemia, adiponectin, triacylglycerols and NEFA, other cardiovascular biomarkers were largely unchanged. Although we noted a slight rise in LDL-cholesterol, we saw no change in blood pressure, endothelial function or other individual cardiovascular inflammatory biomarkers with salsalate. However, our measures of endothelial function assessed changes in small- and medium-sized resistance vessels, without considering larger vessels. Adherence to salsalate treatment was good, as assessed by participant report and pill count, and plasma salicylic acid levels were in the low therapeutic range used for treatment of inflammatory conditions. Indeed, trough salicylate concentrations were routinely measured 10–12 h after a dose was taken, likely explaining the low therapeutic levels. Although salsalate was well tolerated, tinnitus and gastrointestinal side effects did occur. Higher doses beyond those used in this study have been shown to exacerbate these and other side effects, thereby limiting clinical utility of salsalate at even higher doses. The current study has several strengths compared with previous studies. This is a comprehensive study of salicylic acid effects in individuals with abnormal glucose tolerance. Previous studies included fewer participants [15, 20, 22, 39, 40, 41, 42], treated participants for periods ranging from only a few hours to 4 weeks [15, 19, 20, 21, 22, 39, 40, 41, 42], often did not use a randomised, placebo-controlled study design [15, 16, 20, 22, 39] or did not use euglycaemic–hyperinsulinaemic clamp to assess insulin resistance [16, 21, 23]. By titrating salsalate upwards to 4 g/day we evaluated efficacy at its maximum tolerable dose. Measures of C-peptide during fasting, glucose challenge and clamp studies also provided assessment of salsalate’s effects on insulin secretion. Importantly, by reducing insulin infusion rates during the clamp in those who received salsalate to account for its effects on insulin clearance, we also removed higher steady-state insulin levels as a confounder in the calculation of glucose utilisation. As lowering glucose levels per se improves peripheral glucose utilisation [21, 43], studying individuals with impaired fasting glucose and/or impaired glucose tolerance provides a direct assessment of the insulin-sensitising effects of the medication in the absence of hyperglycaemia. There are also several limitations to this study. Since we did not measure endogenous glucose production and lipolysis, the effects on hepatic glucose and lipid metabolism deserve further study. Sufficient numbers of women were not included, with which to confidently extend these results to women. Finally, the study was not designed to determine long-term durability, which would be necessary to translate results into clinically meaningful prevention of diabetes or CVD outcomes. In conclusion, salsalate lowers fasting glucose, C-peptide, triacylglycerols and NEFA, reduces adipose tissue NF-κB activity and increases adiponectin concentrations. LDL-cholesterol levels increased modestly with salsalate treatment, but other biomarkers of cardiovascular health were unchanged, including endothelial function and markers of systemic inflammation. We were not able to demonstrate effects on insulin sensitivity by euglycaemic–hyperinsulinaemic clamp. Thus, the mechanism(s) of salsalate’s metabolic effects remain incompletely understood, although effects on hepatic insulin sensitivity and/or glucose production and insulin clearance are likely. Salsalate may be useful in diabetes prevention, although potential side effects may limit broad applicability. Importantly, understanding mechanisms by which salicylates improve metabolic factors may lead to additional drug discovery applicable to both individuals with abnormal glucose tolerance and patients with diabetes. This material is based upon work supported by the Office of Research and Development, Medical Research Service, Department of Veterans Affairs and NIH K24 DK63214. The contents do not represent the views of the Department of Veterans Affairs or the US Government. PDR and JK had full access to all of the data in the study and take responsibility for the integrity of the data and the accuracy of the data analysis. All authors meet ICJME uniform requirements for authorship, including substantial contributions to conception and design, acquisition of data or analysis and interpretation of data and drafting the article or revising it critically. All authors had final approval of the version to be published.